Obituary for Mrs. Sadie Elizabeth (Rigg) Lamb | Hinchliff-Pearson-West, Inc.
Mrs. Sadie.E. 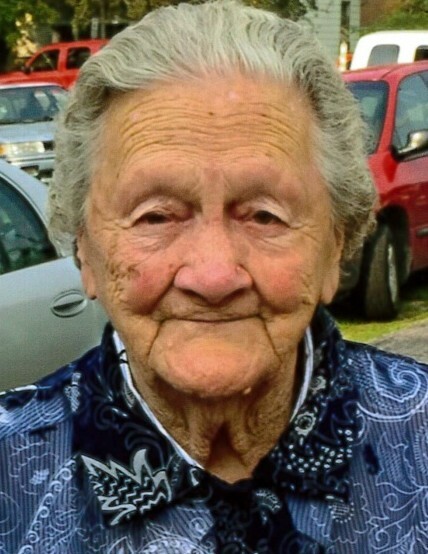 Lamb, 93, of Galesburg died at 12:05 p.m., Saturday April 13, 2019 in her home. Sadie was born July 3, 1925 in Dahinda, Illinois to Garl and Lucinda Mabel (Dawson) Rigg. She married Robert M. Lamb in Kahoka, Missouri on December 6, 1943. Robert preceded her in death July 1, 1991. She is survived by three sons Robert (Kathy) Lamb, Jeff (Vicki) Lamb, and Albert Lamb all of Galesburg, one daughter Charlotte Sue (Larry) Fitzanko also of Galesburg, 19 grandchildren, 31 greatgrandchildren, and 28 great-greatgrandchildren. She is preceded in death by her husband, her parents, four brothers James Rigg, John Rigg, Garl Rigg, and George Rigg, her sister Nellie Wall, one son Jim Wall, one daughter Caroline Keller, friend and sister-in-law Virginia Adams, one graddaughter Diana Mahnesmith, and one grandson Robert E. Lamb. Sadie spent her life in the Dahinda and Galesburg areas. After marrying Robert, she became a homemaker and cared for her six children. She enjoyed fishing and going to the gambling boats. Visitation will be 10 to 11 a.m. Wednesday, April 17, 2019 at Hinchliff-Pearson-West Funeral Directors and Cremation Services Galesburg Chapel. Funeral service will follow at 11 a.m. with Pastor Darrell Grimm officiating. Private burial will be in Westfall Cemetery. Memorial contributions may be made to The Family of Sadie Lamb or Colonial Baptist Church.